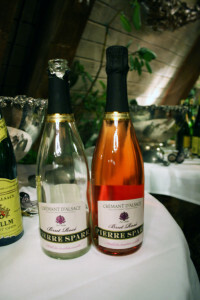 Pinot Noir is the only red grape grown in the Alsace region. Bottles with long, tapered necks are Alsatian. Best known for dry Rieslings and sparkling white and rosé wines (Crémant d’Alsace AOC). 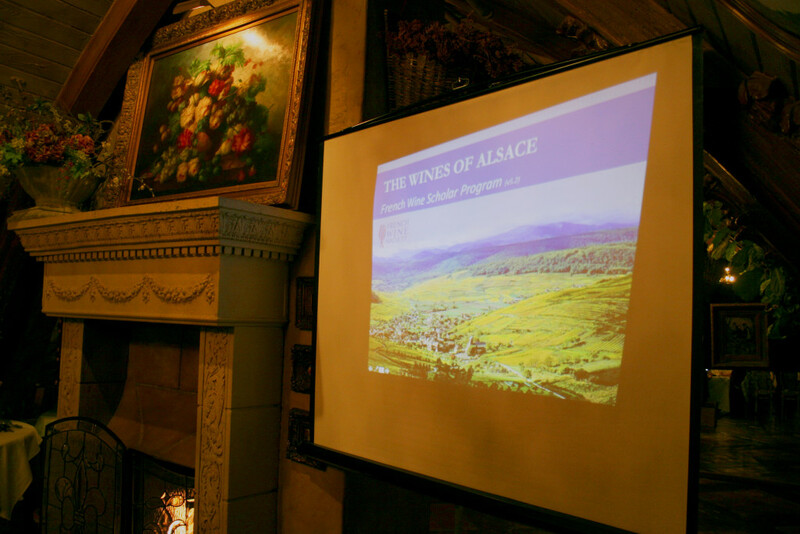 Wasatch Academy of Wine serves as the affiliate provider for the French Wine Society’s courses in the state of Utah, so in our first “real” week of class, we began by diving into the Alsace region of France—an area heavily influenced by war over the years. Because of its location on the German border, the winegrowing region changed nationalities from French to German six times. Although officially French now, the area is rich in German-leaning grapes and wine-making philosophies. The terroir of Alsace has thirteen types of soils and 51 Grand Crus. At one time, more than 50 grape varieties were grown in the area but there are now seven primary grapes—Riesling, Pinot Blanc, Pinot Gris, Pinot Noir, Sylvaner, Muscat and Gewürztraminer. 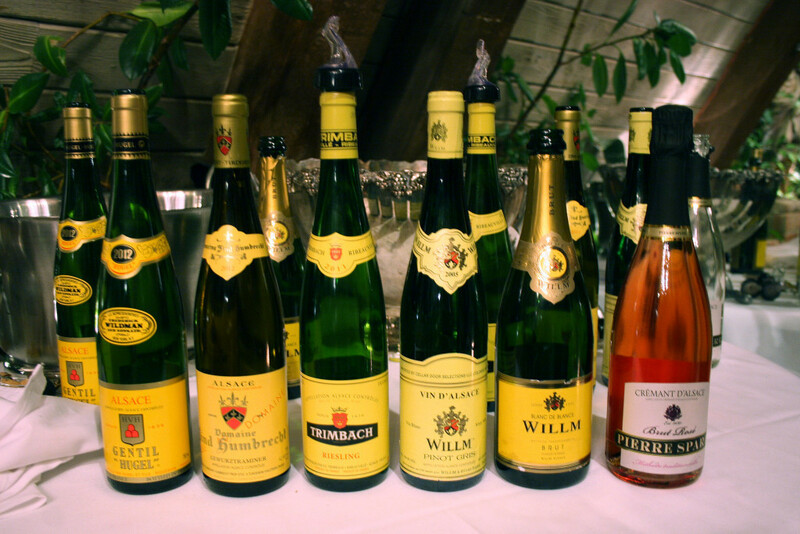 Four of these—Riesling, Pinot Gris, Muscat and Gewürztraminer—are known as the Noble Grapes of Alsace. These are the only grapes that fall under the Alsace Grand Cru AOC (Appellation d’Origine Contrôlée). 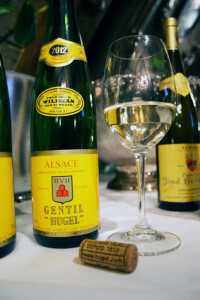 Hugel et Fils Gentil “Hugel” 2012 – This is a blend from 12 vineyards in Alsace. 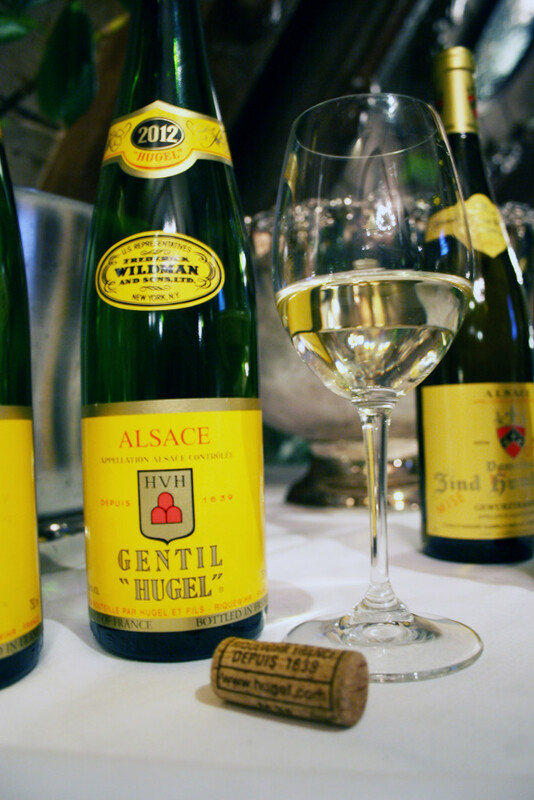 “Gentil” means that 50% of the grapes must be Noble. You’ll find this bottle on La Caille’s wine list and at the wine store. Aromas of citrus, green apple and almonds lead this wine to pair well with arugula, sushi and Muenster cheese. Trimbach Riesling 2011 – You’ll also find this bottle on La Caille’s wine list. It is 100% Riesling and fermented to dry. 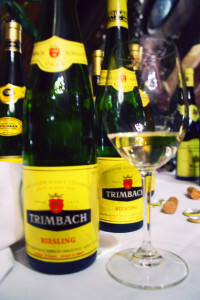 Trimbach is the largest winery in the Alsace region and the bottle labeling hasn’t changed since 1960. The crisp acidity of this wine pairs well with shellfish, smoked trout and poached chicken with Dijon mustard. 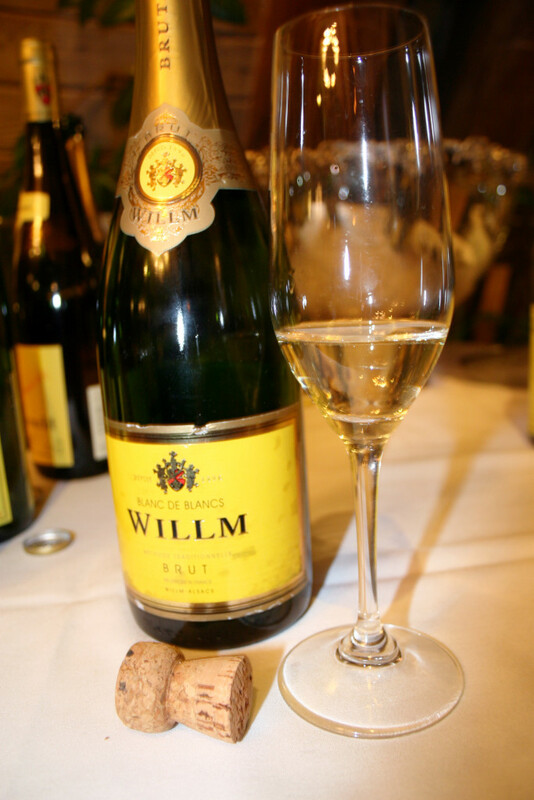 Willm Blanc de Blanc Brut Crémant D’Alsace – You won’t find the Gewürztraminer grape in any Crémant D’Alsace. 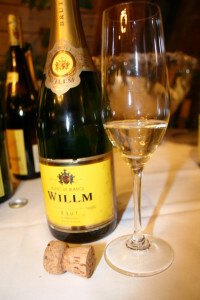 Fruits such as apple, peach, apricots as well as honey are characteristic aromas of this northern Alsace sparkling wine and make caviar and Chinese foods sing. 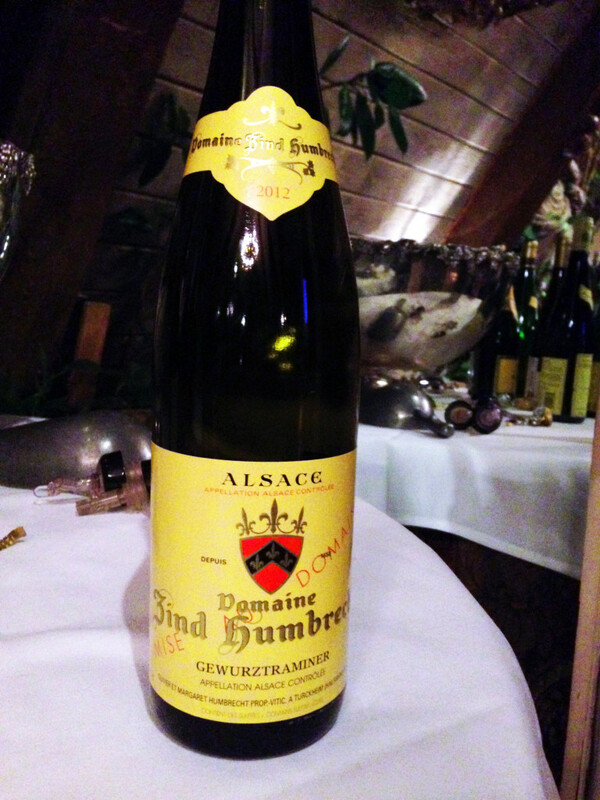 Domaine Zind Humbrecht Gewürztraminer 2012 – Dry and delicate, this certified biodynamic wine offers up hints of spices which means it’s no surprise it pairs perfectly with Indian food. It’s aged for 8 months in 40 year old French barrels. 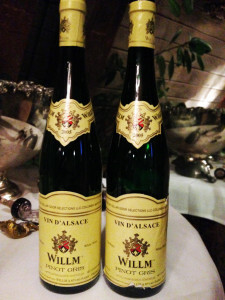 Willm Pinot Gris 2005 – With a smoky taste and aroma of baked apple, pair this with game, mushroom risotto, parsnip soup and fish. Pierre Sparr Brut Rosé Crémant D’Alsace – This Pinot Noir sparkler spends 12 months on the lees and is a great accompaniment to barbecue.